Set behind the gates of the Big Island’s exclusive gated neighbourhood of Kukio sits an impressive private home designed by award-winning architectural firm de Reus Architects. 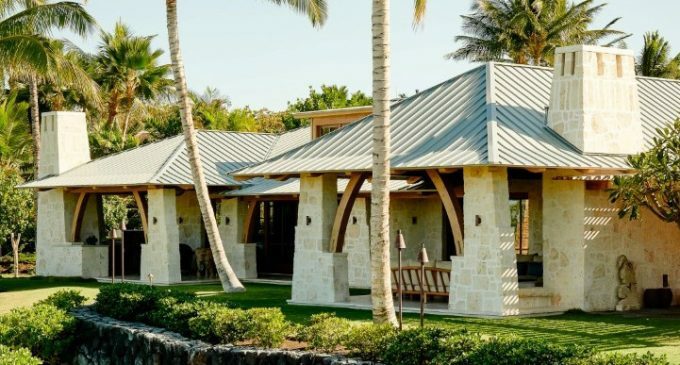 Spanning more than 12,000 square feet, the stone residence overlooks natural coastal anchialine ponds with views over Kukio Bay and Kikaua Point. Philpotts Interiors handled all the interior design while Oakes Management, LLC served as the general contractor. Philpotts Interiors explained the process of the design. “Aiming for a welcoming, Old World environment that blended the spirit of the Arts and Crafts movement with Old Hawaii, we selected materials and finishes including local ohia hardwood, white coral and travertine stone floors, and curated a mix of the family’s existing collection with new procurements to adorn the home.” Many billionaires own vacation homes in Kukio with some values exceeding $60,000,000. According to Forbes, residents include Michael Dell, Paul Hazen, David L. Anderson and David Roux.